I've heard it too many times. 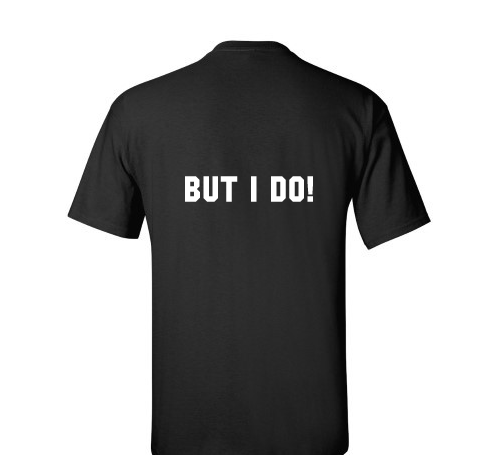 So now I plan to wear it in irony. There's this notion that lingers and hasn't been dispelled yet - one that perpetuates the belief that "QA can't code". I'd like to send two messages with this simple statement. This is a push for a re-branding. I am not a fan of the job title QA (aka "Quality Assurance"). I've said it before - "I don't assure quality; I test software." Maybe quality inspectors can't infact write code, which is fine. But then I don't want to be a quality inspector. This is also meant to be an ironic statement to spark a discussion. Why can't QA code? I'm a QA Specialist by title..and I can write code. So why then do I often hear amongst the industry that writing code is reserved for developers? In the modern "Agile" era, where every member is responsible for every stage of the development process in one capacity or another, QA can code. 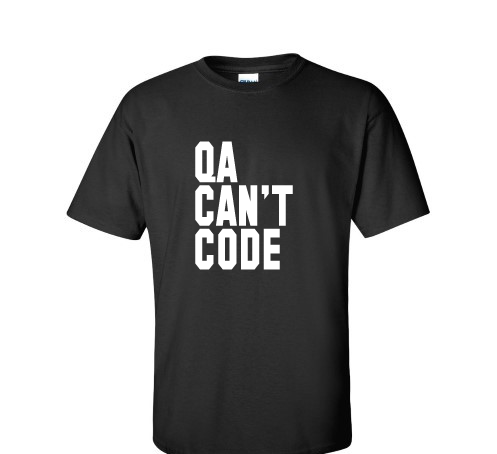 Infact, QA should code! There's a larger and more well thought out blog post to follow on this topic. For now, I'm just going to mention that these shirts will be available for sale (at no profit to me) for anyone that agrees, and feels like making this bold statement with me. *EDIT*: Design has changed thanks to a suggestion from Jim Hazen!